We've seen V8lvos here before on Nice Price or Crack Pipe, and for some reason, they always seem to be blue. Today's is no exception, however its claimed 290-whp does seem pretty exceptional. The advancements in human organ transplant in the past fifty years are also exceptional. The ability for an individual to survive, and live a more active life after having a major organ failure is a remarkable advancement. Sadly for the seller, the same couldn't be said for yesterday's Turbo 13B-transplanted RX2, despite the close relationship between it and its donor. In the same manner that a body may reject a new organ, 65% of the votes shunned the sixteen grand price, leaving the Mazda on Crack Pipe life support. Today's 1986 Volvo 740 wagon is also an organ recipient, but in this case it only shares blood type with its donor - 92 octane. While yesterday's Mazda seemed built for both show and go, this Stockholm stormer is likely a rocket, but comes across a little rough around the edges visually. That's not to say it looks like a family of soccer hooligans live in it, but - like a prom dress the morning after - it shows the wear and tear of the fun that's been had in it. Much of that fun can be traced to the LT1 and T56 drivetrain combo that has been slid under the big box's hood. The 740's engine bay is sufficiently commodious that even the small block Chevy and all its related plumbing looks a little lost in there. That might lead you to thinking about dropping in a supercharger to keep the motor company, but with already a claimed 290 horsepower at the wheels, the V8 could happily continue as an only child. This particular 740 originally was a manual car so the T56 switch should have been relatively straightforward, and it's a fairly common conversion. That being said the Camaro shifter in the car looks a little too far forward for comfortable rowing. The car has 154,000 miles on it and, as it's a Volvo, that means it's just getting broken in. The interior however, is a little more than broken in, looking a bit scabby around the edges. The seller (who seems obsessed with the carpets) claims to have an almost entire extra interior that he'll throw in with the dealio, and you can install at your leisure. That way you'll have something to do with the car when you're not doing donuts in the parking lot at the kids' soccer practice. He also lists a litany of refreshed parts and upgrades that come with the purchase price- including 960 door handles, woot! Another add-on is evidenced by the white piece of bodywork behind the front bumper which is part of an aero kit that the seller hasn't fully mounted yet. These kits are typically designed to make cars look less attractive so thieves won't steal them. In this case it seems to be working, although I think I'd replace it with the stock front valance and take my chances. The unpainted fiberglass on this blue car makes it look like it's got a Colonel Sanders goatee, which makes me think of fried chicken and dammit, now I'm hungry. The seller says the LT1 was dropped in back in '97, and that the transmission and clutch were rebuilt not to long ago. These parts are pretty rock solid reliable - as is the basic Volvo 700 platform - and so this wagon should rival cockroaches and Angelyne for post-apocalyptic survivability. 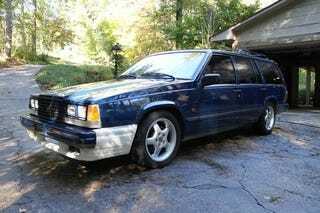 So, what do you think about this V8 Volvo for $8,500? Does it make you eager to be a money donor? Or, does that price mean all the Prednisone in the world couldn't keep you from rejecting this transplant?